If I asked you to name some of the world’s greatest picture book creators, who would you name? 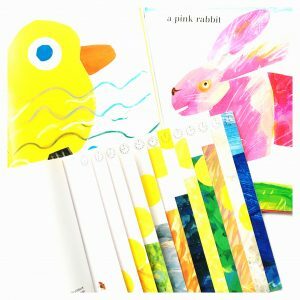 This simple Eric Carle art project for kids introduces mini makers to the glorious collage technique of one of the world’s greatest picture book creators. 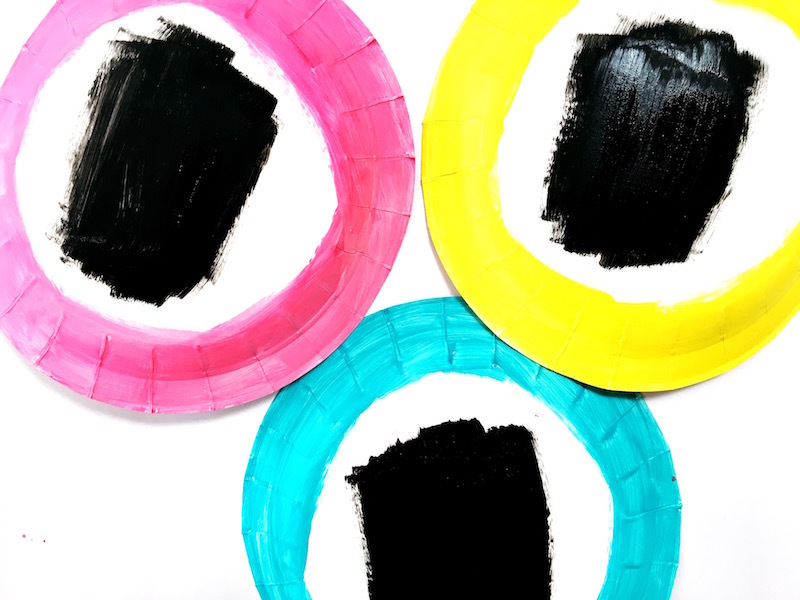 It involves painting tissue paper to create some seriously eye-popping results. 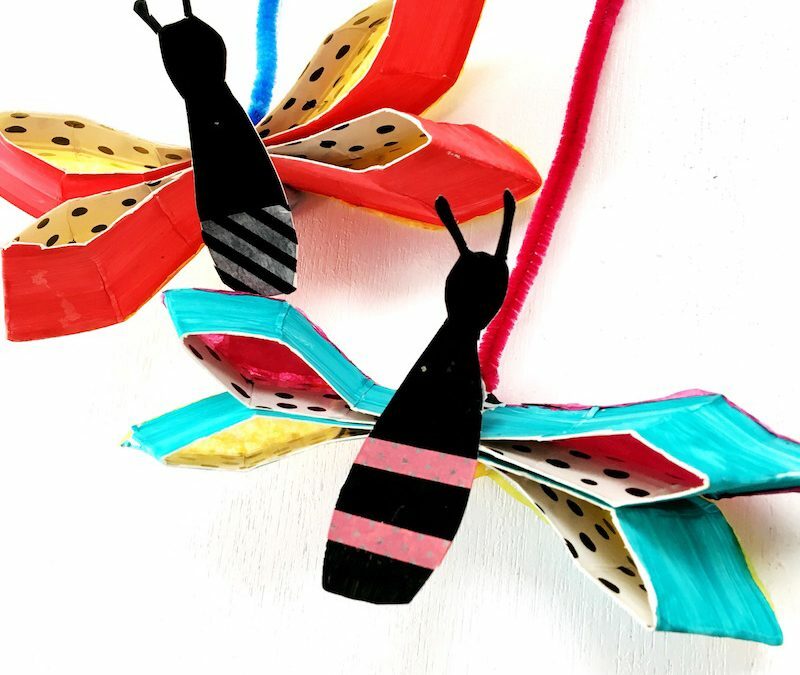 One of my most popular posts in the history of this blog, involved making a wall hanging using this Eric Carle-inspired process. It felt about time to whip this project out again to create something new. Gotta love a fun process that leads to glorious products, right? 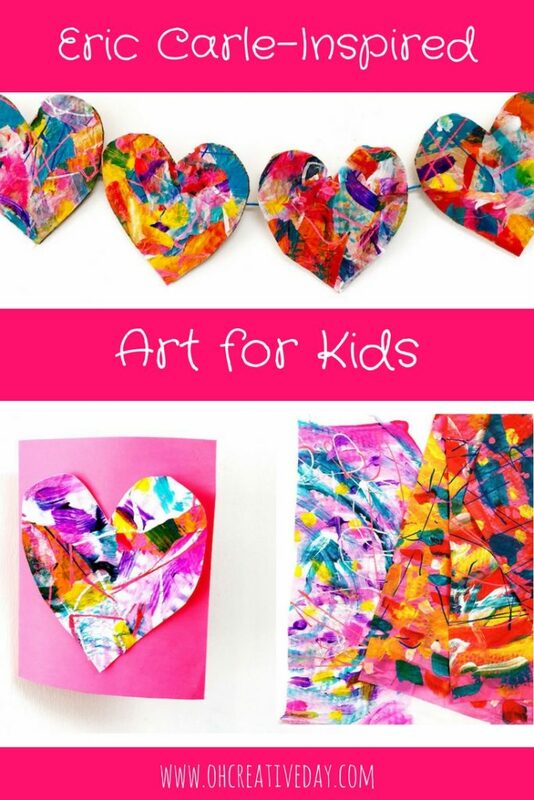 You can then turn your painted tissue paper into cards, garlands, wall hangings, illustrations…. if you can imagine it, you can create it. 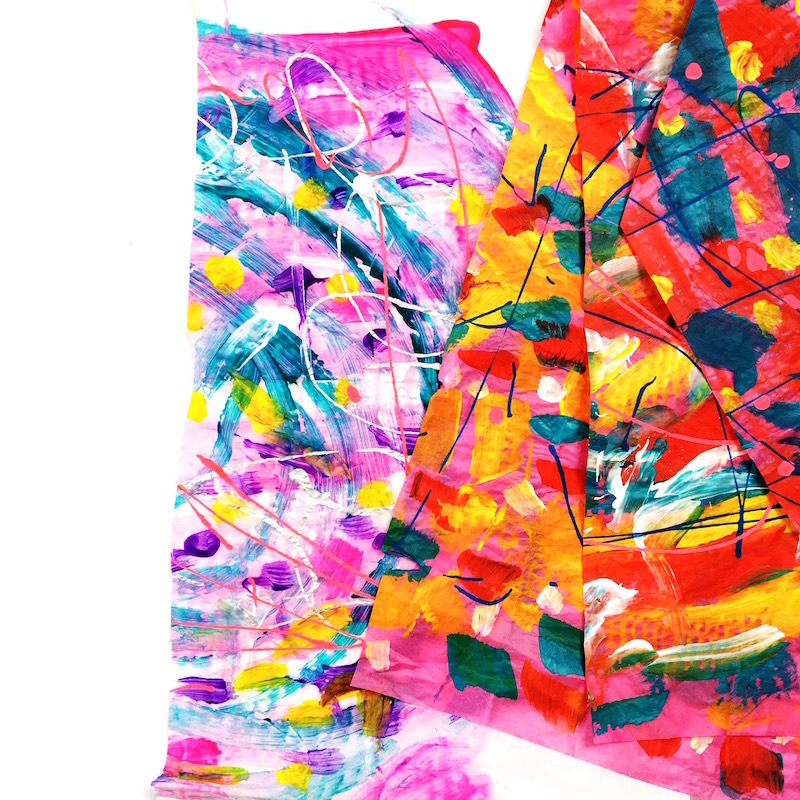 You can read about painting tissue paper from Eric Carle himself here. Or check it out in our video! Here are some tips from what we learned from the experience. You will need some thick cardboard to lay under your tissue paper to prevent the paint bleeding through to your work surface. I pulled apart an old nappy box. 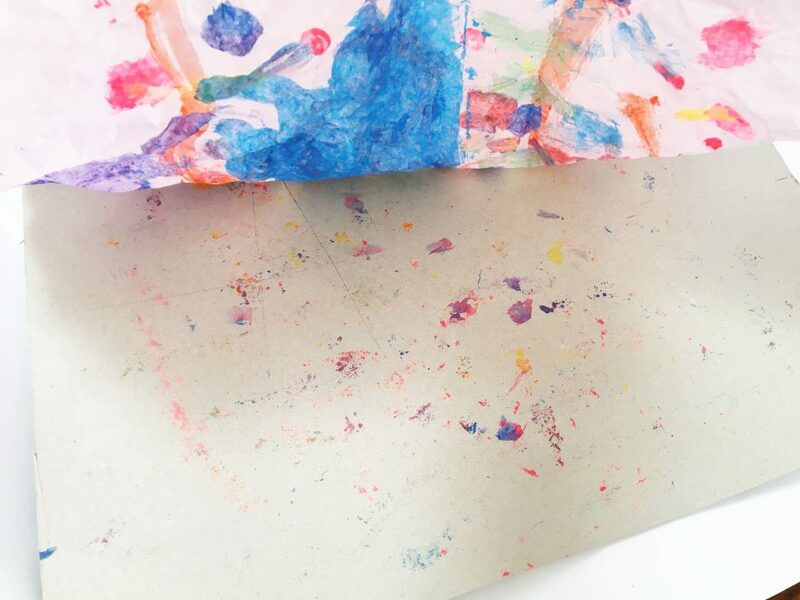 As you apply paint to the tissue paper, lift up your sheet of tissue paper frequently. This will stop the paper from sticking to the cardboard. Eric Carle applies his paint in layers. For example, he works on a red layer and then lets that sheet dry. Then once dried, he applies another layer of paint. We went for a process that explored different paintbrushes and strokes. So we applied all our layers at once, doing different lines and dots. We then finished by using IKEA Mala paints, in their excellent squeezy bottles, and squeezed haphazard lines onto the paper. Once your tissue paper has dried, tear it up into little pieces. You now have an instant collage box of goodness! 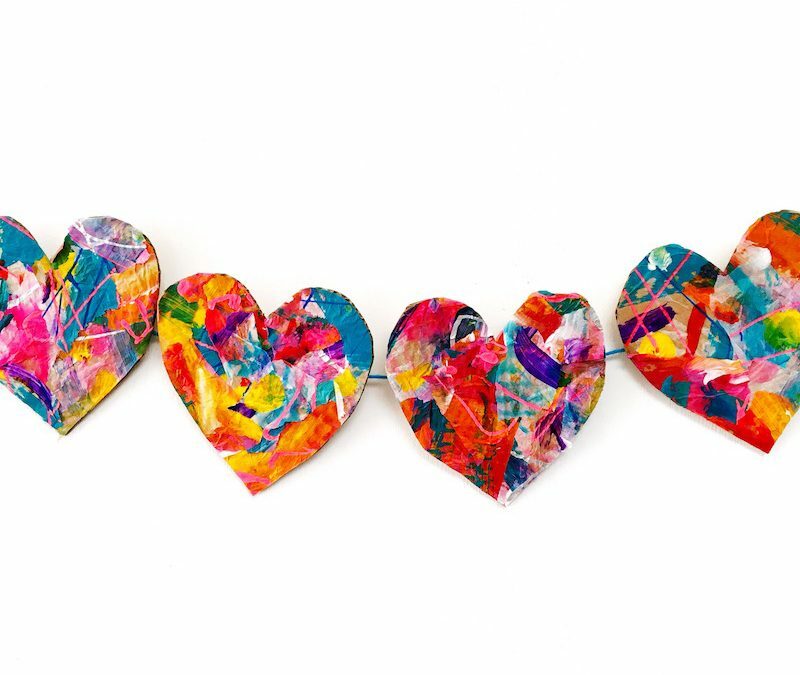 We traced hearts onto cardboard offcuts and cut these out. 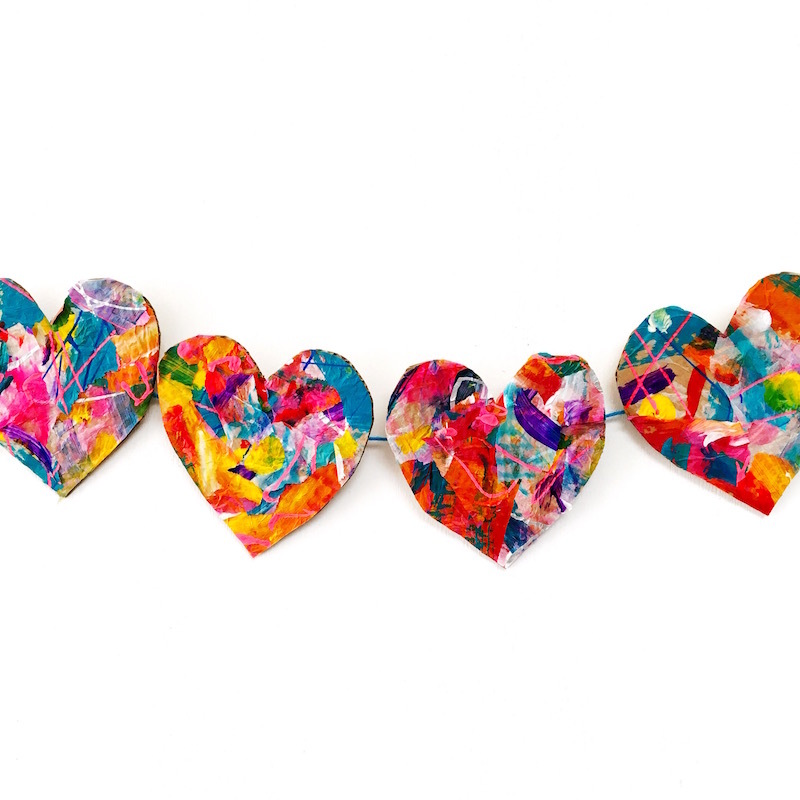 Using craft glue, we then covered our cardboard hearts with painted tissue paper. Trim away any excess overhanging the edges. 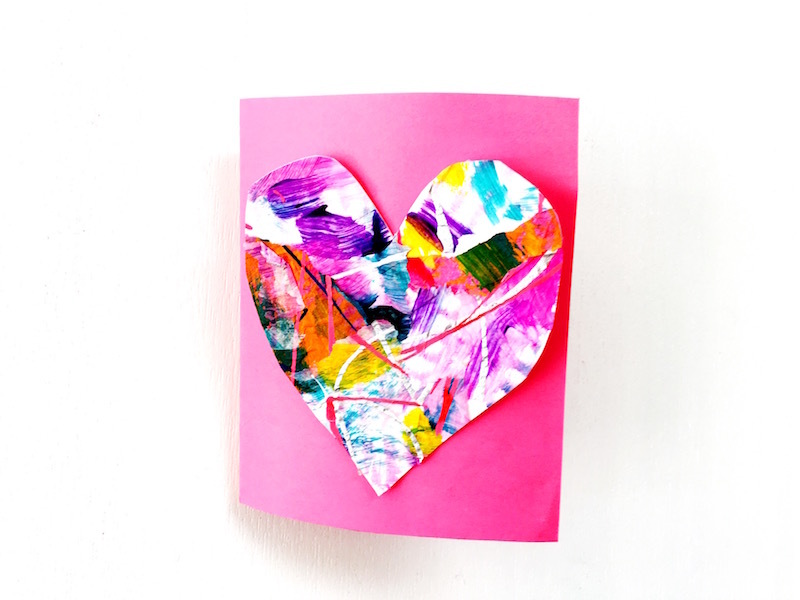 Once dried, you can glue your hearts to some thin cardboard to create a homemade card. Or you could create a garland. 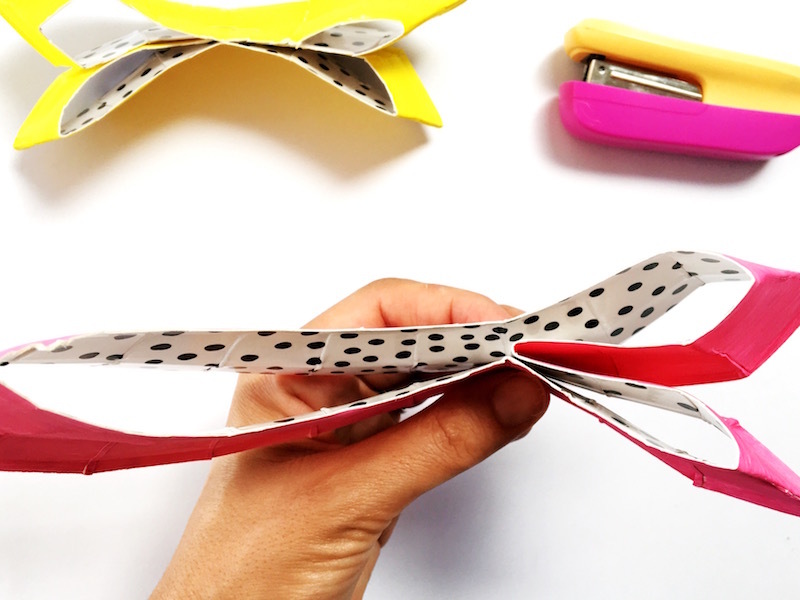 Here’s an excellent garland-making tip that I learned from my friend Shelly at Creating Creatives. Cut up a straw into small intervals. 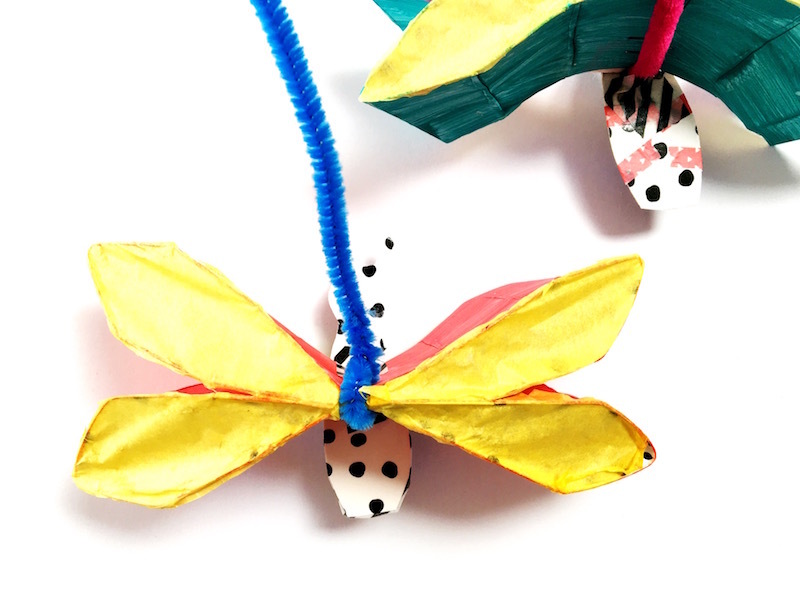 Use a hot glue gun to secure these bits of straw to the back of your hearts. 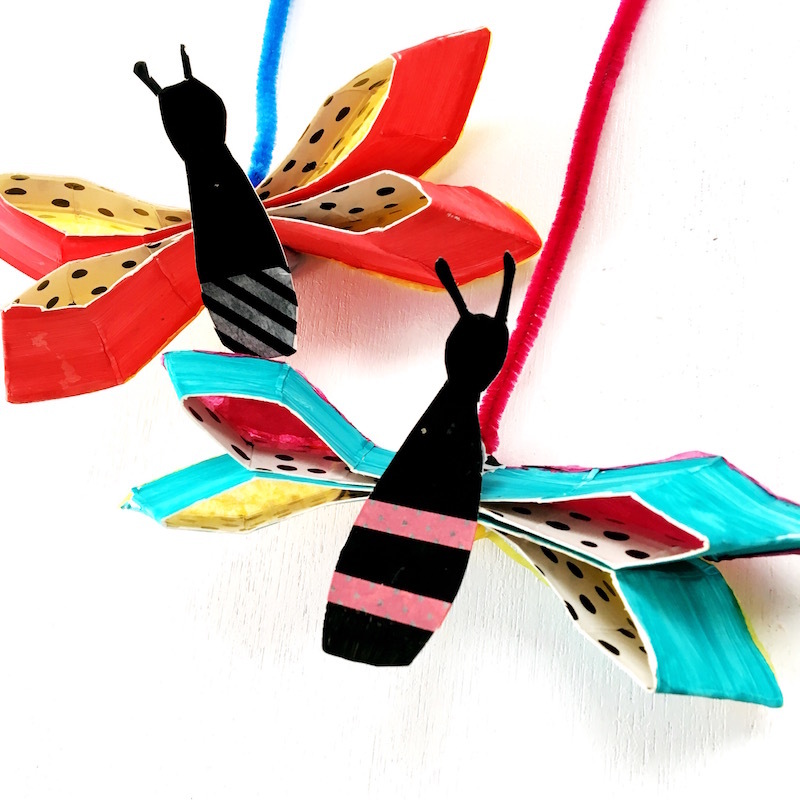 Once the glue has dried, you have an easy way to string yarn through and a super simple way to make a garland! The Amazon links will take you to Amazon. I am an affiliate with Amazon and will receive a small commission. You do not pay any extra for your books. If you prefer Book Depository, click here. If you are Australia based, you may prefer Booktopia. 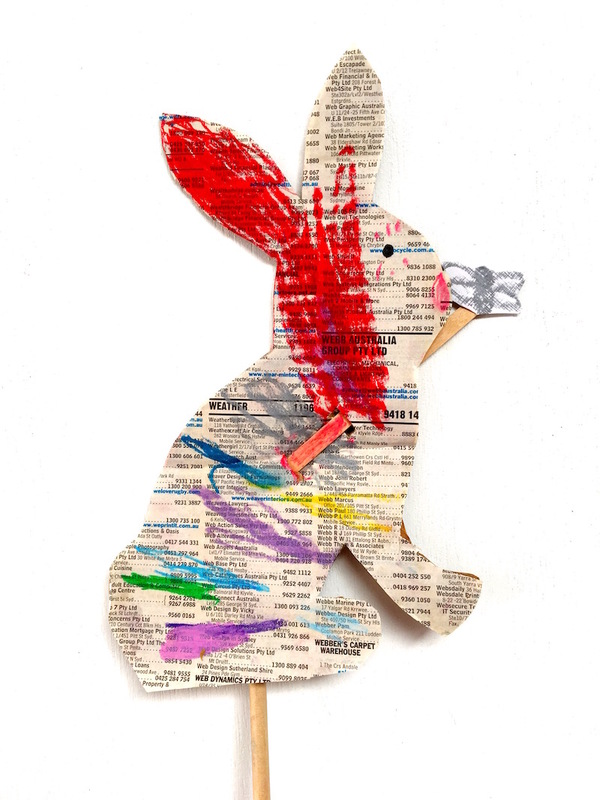 This Little Peter Rabbit craft, with it’s moving fly, was inspired by my inability to stop humming the song about him and the fly on his nose. 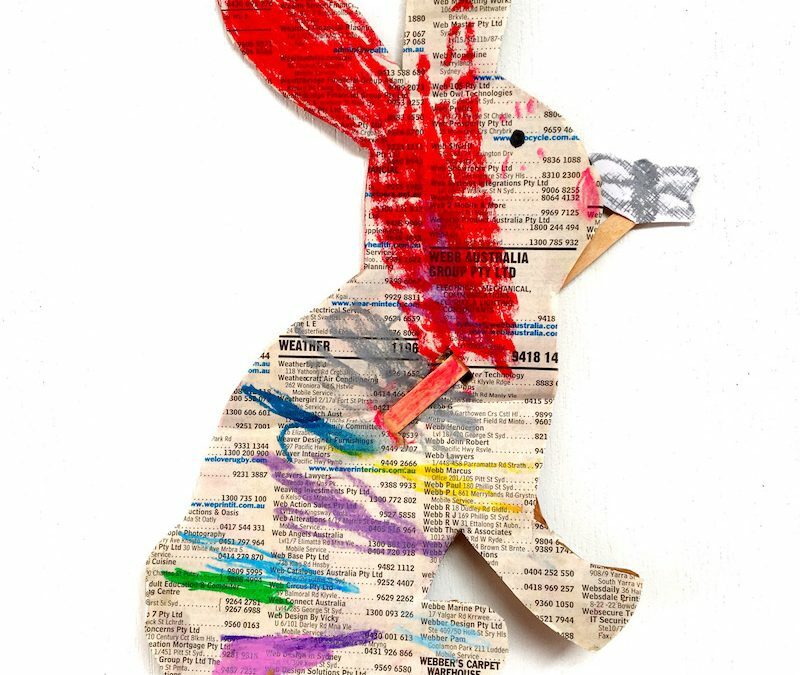 I think this earworm was firmly embedded as a result of the combination of Easter and the new Peter Rabbit movie. Here in Australia at Easter, we replace “Peter Rabbit” with “Barry Bilby” when singing this ditty. Feral rabbits are a pest here in Australia that destroy the habitats of our native fauna. To raise awareness about the environmental damage that rabbit cause, whilst drawing attention to the plight of endangered species, conservation groups have made the bilby an Australian Easter icon. 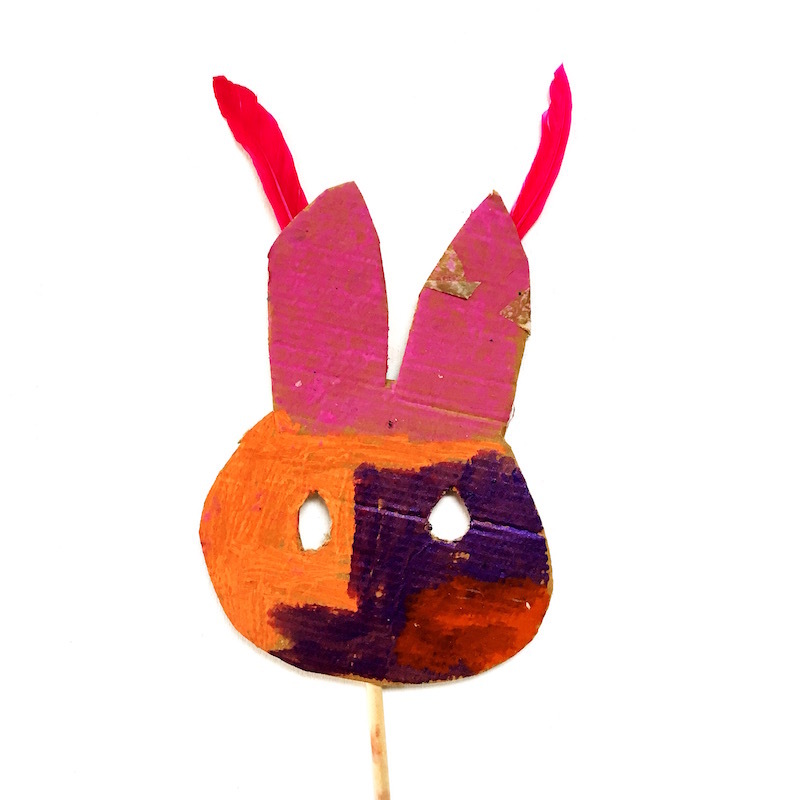 Print off your Bunny or Bilby template. 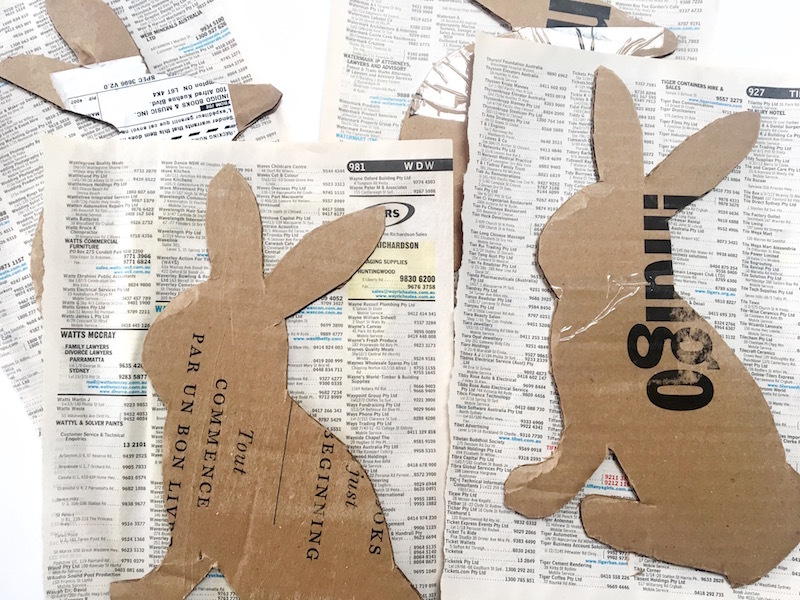 Trace your bunny or bilby onto cardboard. As per usual, we just reused old boxes. Glue your paper onto the cardboard. We used old White Pages. 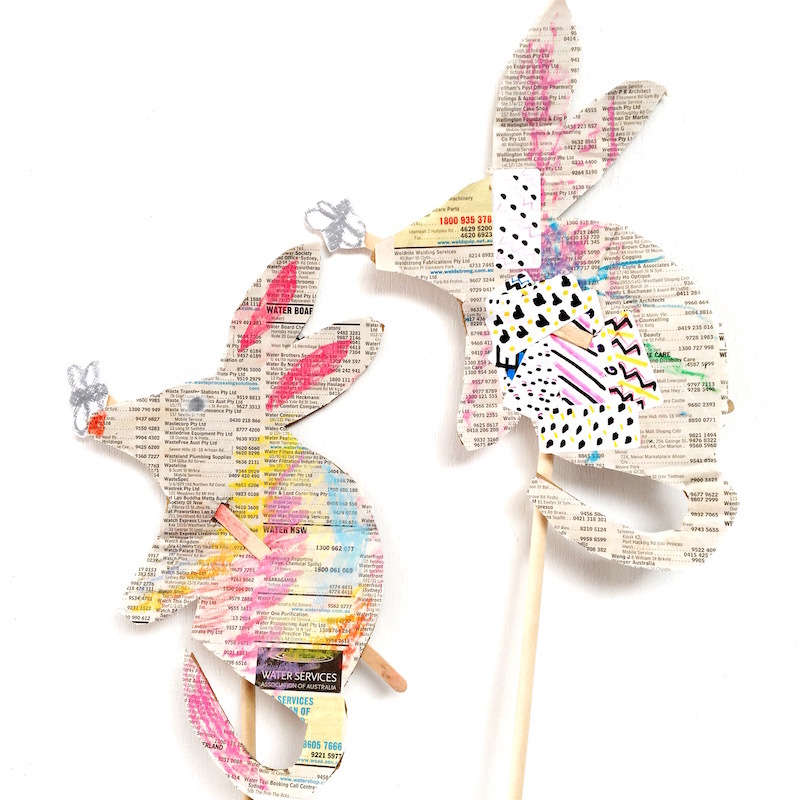 This Peter Rabbit craft also coincided with a clean-out of the craft cupboard. We rediscovered the chalk pastels and oil pastels. I presented those materials and let the children create. Mr almost-2 went rogue and found some stickers I had doodled on. I adore what he did. 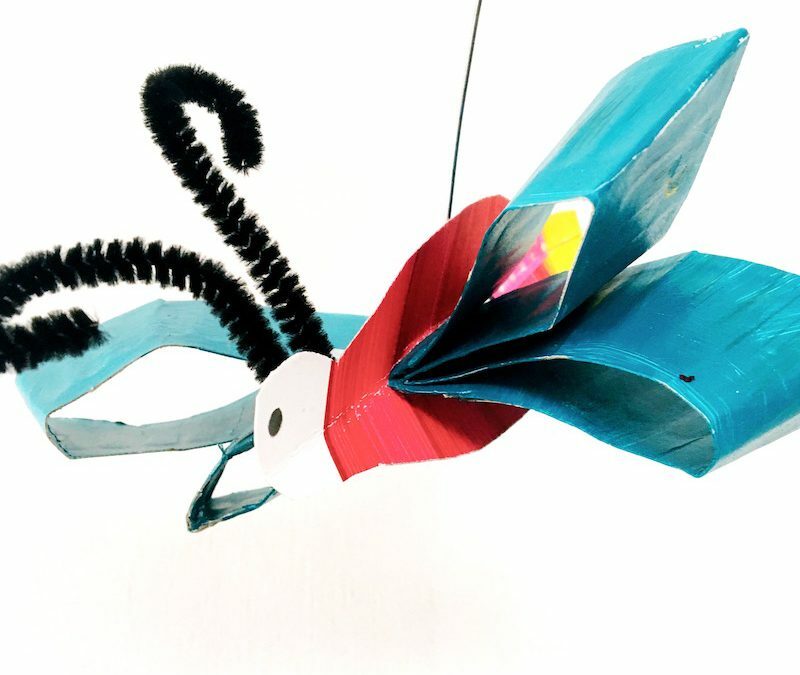 Draw a fly and glue it onto a craft stick. Cut two slots into the body of your puppet and thread the craft stick through. You may need to widen these slots to allow for “wiggle” room. Depends on how exuberant you want your fly to be. Tape dowel to the back of the cardboard. Prepare to sing “Little Peter Rabbit Had a Fly Upon His Nose” a gazillion times! 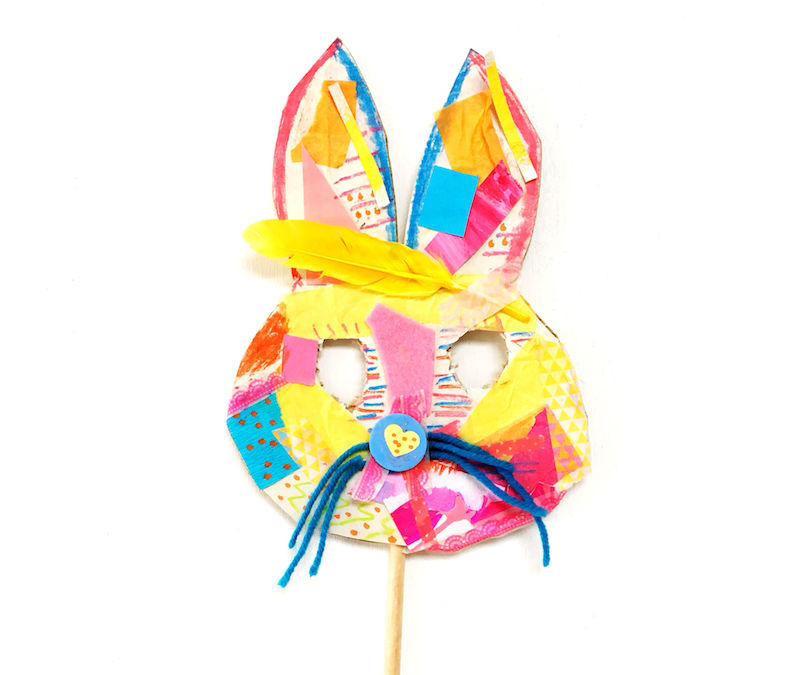 I had no intention of sharing this bunny mask craft. We hosted our littlest’s first birthday party on the weekend and celebrated with a Miffy theme. It’s our last first birthday. All them feels. 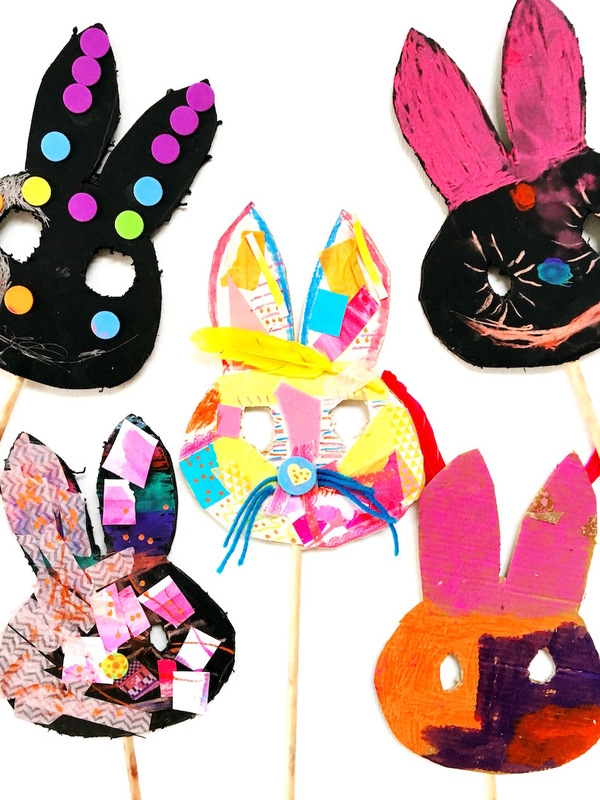 Our kiddy parties always have a craft station for the little party-goers. I like to think of the craft station as a “Buying-Time-for-Parents-to-Eat-Cheese-and-Crackers-and-Have-a-Conversation” situation. 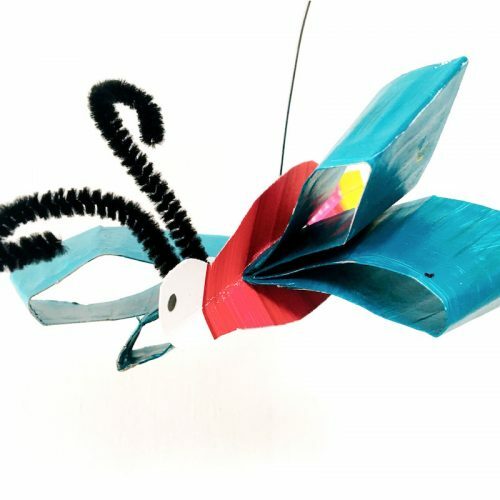 But of course it’s mainly for the little ones to get creative and indulge their craftiness. 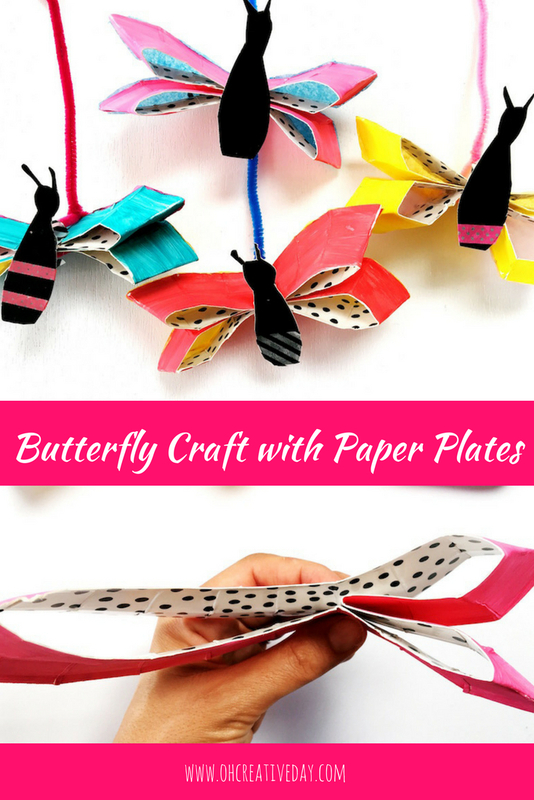 The craft station is always popular but I was pleasantly surprised at how popular this simple crafty invitation was. 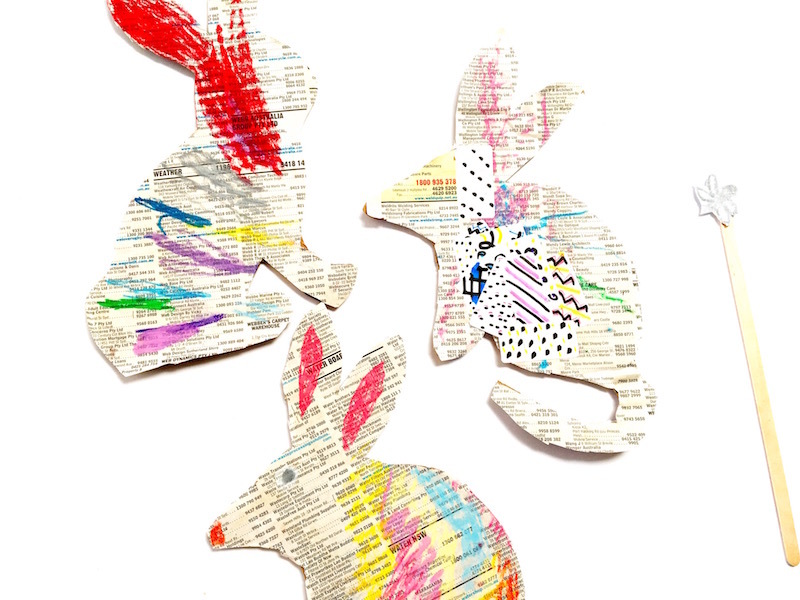 So I thought I’d share it with you, as well as the free printable template, in time for Easter. And so that you too, can indulge in some cheese and crackers whilst the kids are entertained. 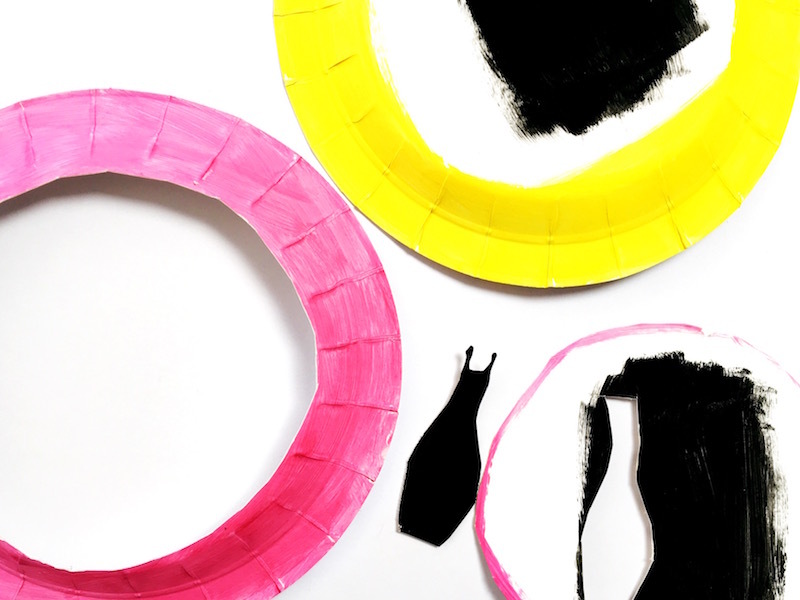 Markers, paint pens, paint sticks, chalk pastels – whatever you have on hand! 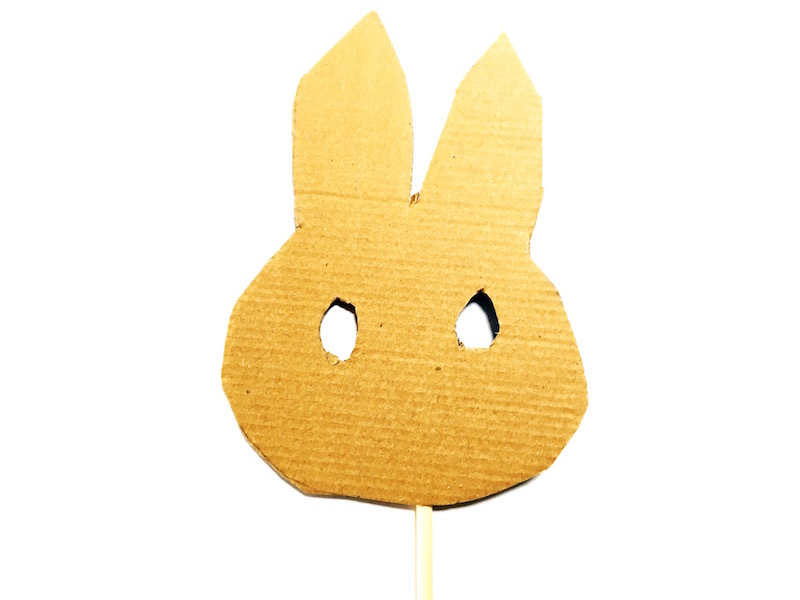 Print and cut out the Bunny Easter mask template. 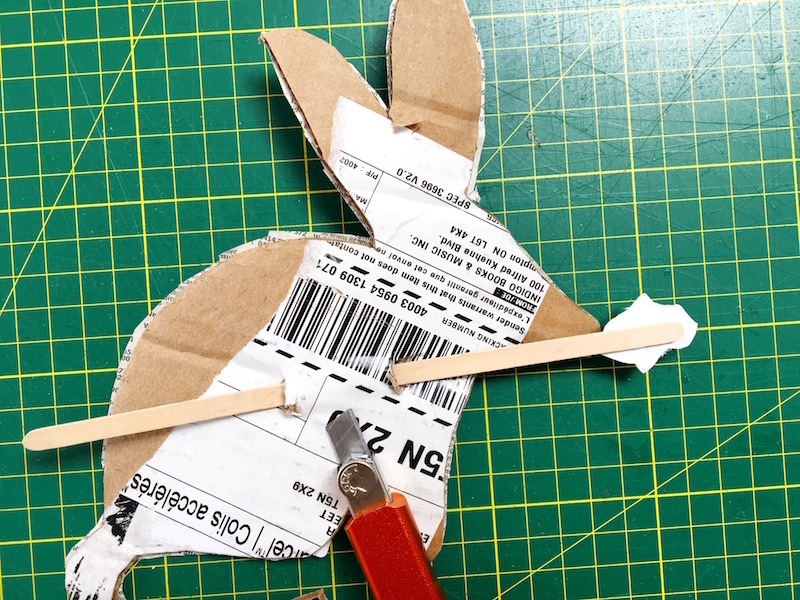 Trace the bunny onto pieces of cardboard. I used all the old cardboard boxes from online shopping that have been piling up. Due to the thickness of the cardboard I used, I used a craft knife to cut the masks out. I realised towards the end of the process that my craft knife was very, very blunt. Face palm. So my edges were pretty rough. Let’s call it rustic charm, yeah? If you go the craft knife route, please use a cutting mat! Safety first, people! If you use thinner cardboard, sharp scissors should do the job. I then just taped the dowel to the back of the cardboard with decorative duct tape. We actually made more masks a few days after the party, because I was interested to see if this project was still as popular. I pulled the collage box out of the craft cupboard. I store all paper scraps in a fishing tackle box. 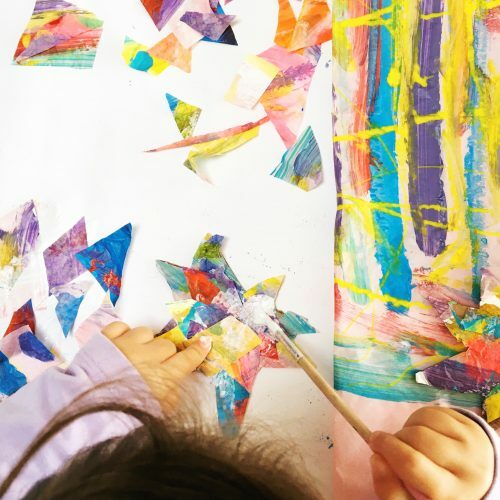 You can find some tips and tricks for collage with kids here. I also offered paint sticks, Posca pens and chalk pastels. Feel free to make use of whatever you have at hand. In all honesty, it wasn’t a very organised set up. There were materials flying everywhere. But I kinda love those kinds of sessions. 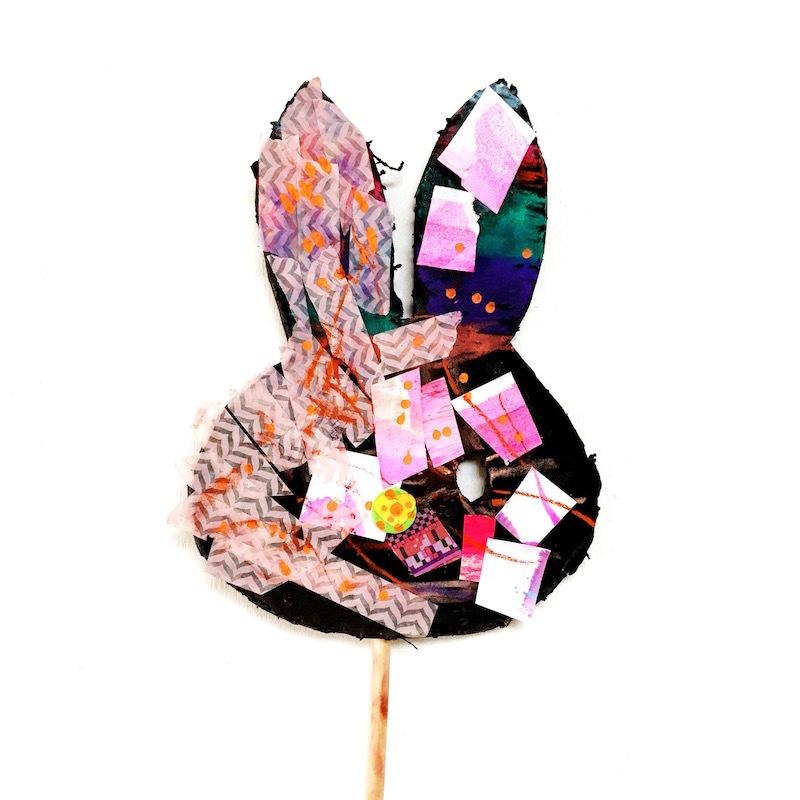 However, sometimes it is a good idea to limit the materials on offer as young artists can get overwhelmed by choice. 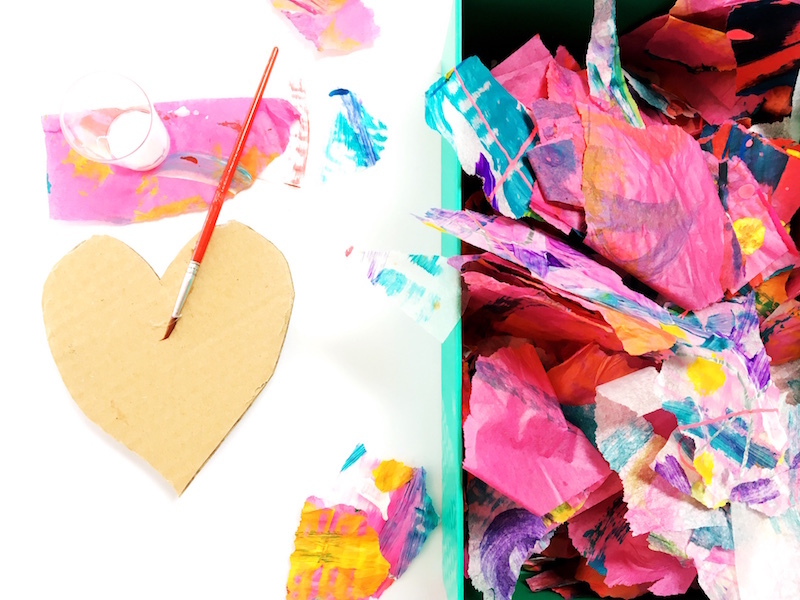 For me this experience highlighted how valuable it is to create alongside your littles. Miss 4 has an intense love affair with colouring-in at the moment. She made about 4 masks in 10 minutes flat, using the markers and chalk pastels. So I sat with her and explained the process I undertook. If I had attempted to guide her process like this from the start, she would not have had a bar of it. She is definitely a child who likes to go her own way. Happy mask-making! And happy cheese-eating! Did your family catch everybody’s favourite bear when Paddington 2 hit cinema screens late last year? 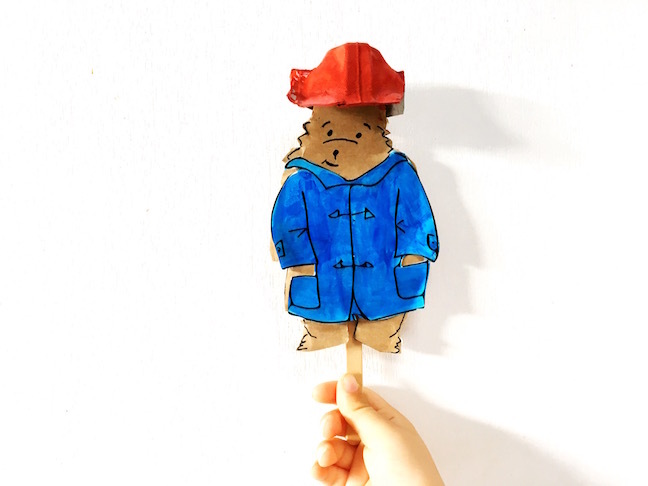 To celebrate the release of the film on DVD and Blu-Ray, the Mumtastic team asked me to come up with 3 Paddington craft projects. Head to the original Mumtastic post for all the free printables. 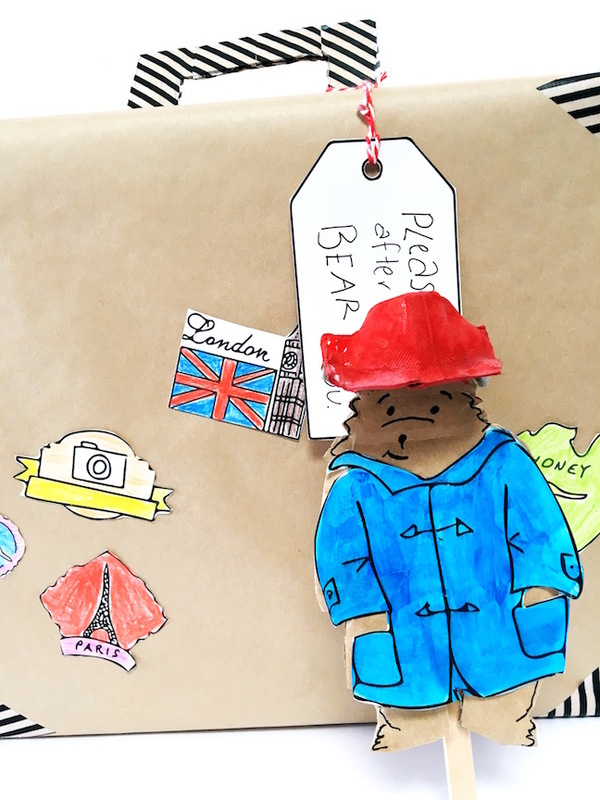 Any mention of Paddington craft of course had to refer to his suitcase! I’ll show you how to make this suitcase out of shoe box or cereal box. Download and print off a copy of luggage stickers on the Mumtastic site. 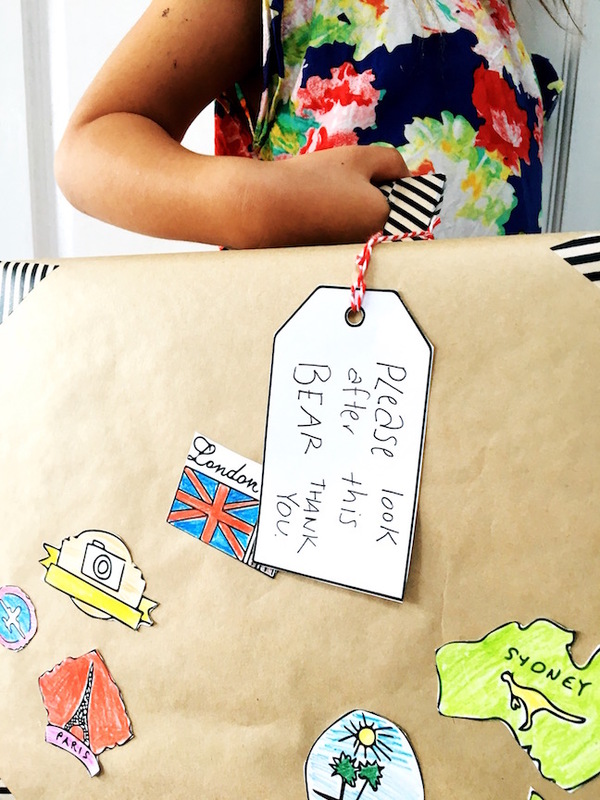 You could store marmalade sandwiches in your suitcase (Paddington would approve!) 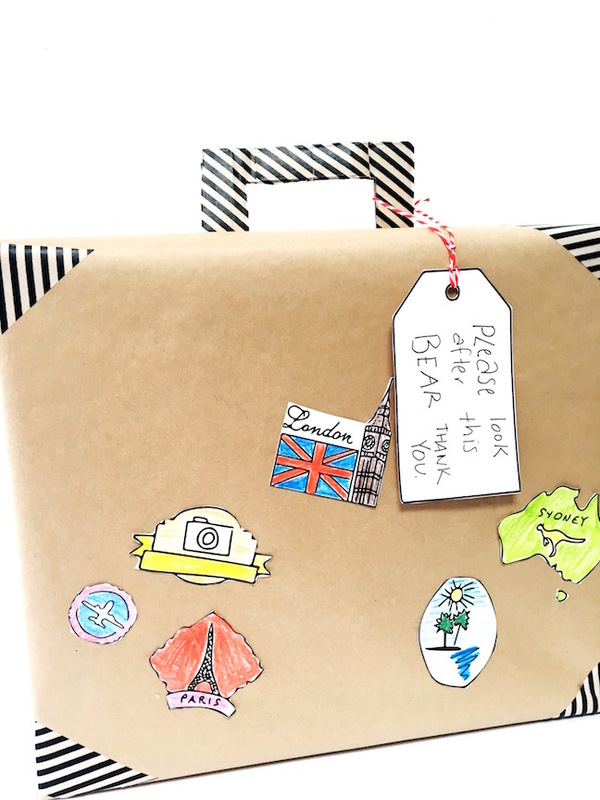 or you can turn your suitcase into a puppet theatre. 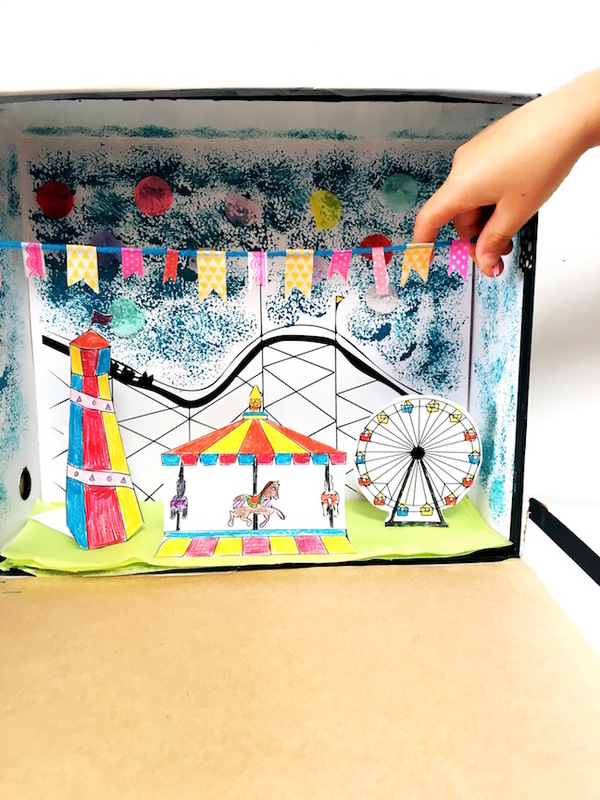 Print out these fun fair templates and create a scene inspired by one of my favourite parts of the movie (the bit where we meet High Grant’s character. 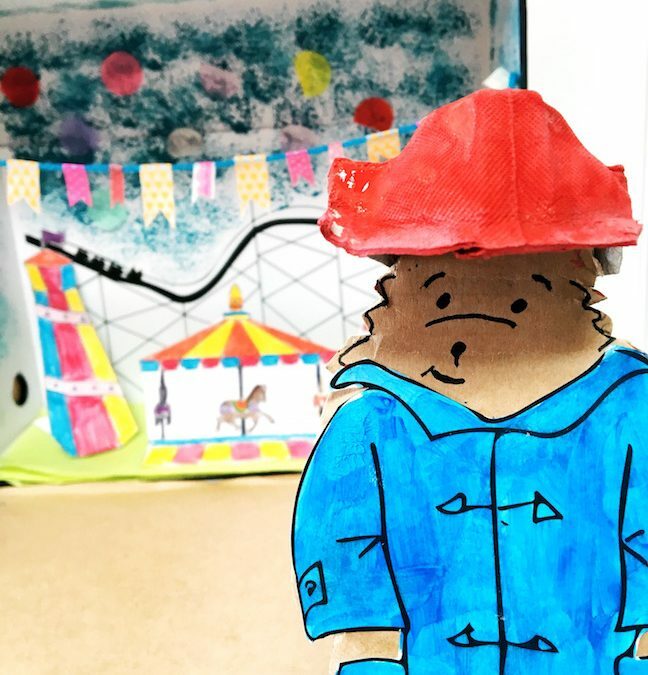 You have a suitcase puppet theatre and now you need a Paddington puppet. 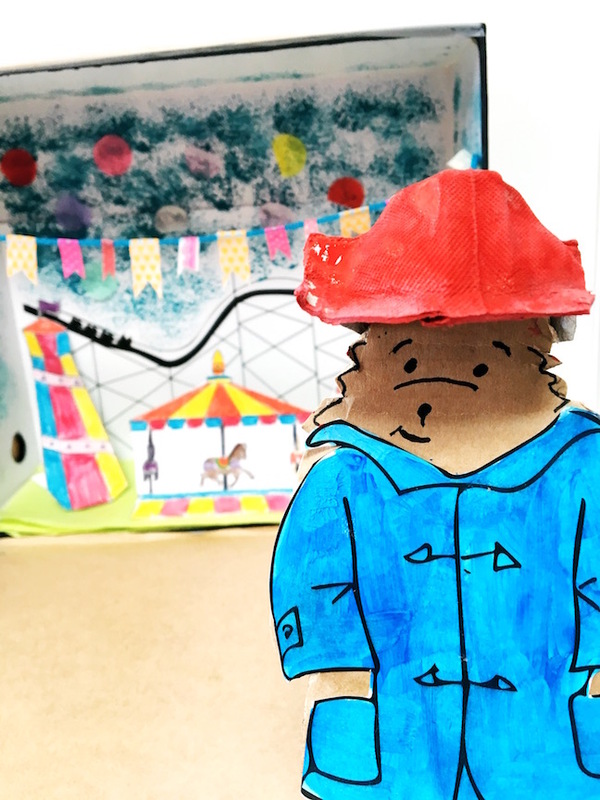 You can download the template and create a wardrobe of anoraks and hats for your puppet.